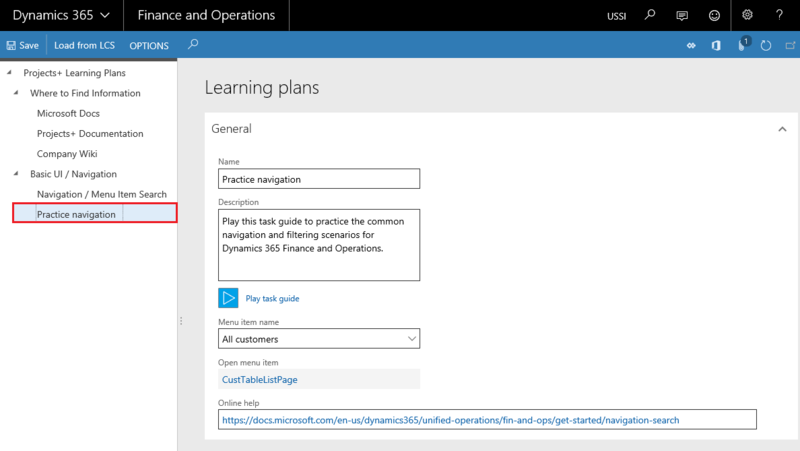 *This section explains how the learning plans can be loaded from Microsoft Dynamics Lifecycle Services into the Microsoft Dynamics 365 for Finance and Operations. This section also guides how the learning plans are used to get familiar with the topics loaded from Microsoft Dynamics Lifecycle Services. A new form has been introduced for the users to load the learning plans from Microsoft Dynamics Lifecycle Services in business process modular structure. The Training plan manager or system administrator can load the tasks guides from Microsoft Dynamics Lifecycle Services and maintain it, provided he\she has the access to Business Process Modeler’s from Microsoft Dynamics Lifecycle Services. For the other roles access of this form will be in read only mode. Go to Help and Support > Learning plans. Tree section: shows the business process modular’s from Microsoft Dynamics Lifecycle Services in the tree structure, once users loads the data from Microsoft Dynamics Lifecycle Services. Learning plan section: shows the information for the selected business process modeler details. User can add the information in this section and save the details. Load from LCS Provides the ability for user to load the Business Process Modeler’s from Microsoft Dynamics Lifecycle Services. Save Button Saves the changes user has made on the form. Play task guide This button helps in playing the task guides attached with the selected Business Process Modeler. If no task guide is attached to the Business Process Modeler, this button will be disabled. Name Shows the name defined for the selected node in the Microsoft Dynamics Lifecycle Services. Description Shows the description defined for the selected node in the Microsoft Dynamics Lifecycle Services. Menu item name Shows the menu item associated with the Business Process Modeler for the selected node. Open menu item Shows the link of the menu item associated with the Business Process Modeler for the selected node. On selecting, this will open the form or workspace as defined by the user. If the description contains table of form information, that will be shown in this field. Online help Shows the online help link for the selected node. If the description contains a web address, that will be shown in this field. This section outlines the process required to be completed in-order to setup and use the learning plans. Training plan manager or system administrator logs into the Microsoft Dynamics 365 for Finance and Operations and load the Business Process Modeler’s from Microsoft Dynamics Lifecycle Services. Note: Make sure the logged in user has the required access in the Microsoft Dynamics Lifecycle Services. Once the Business Process Modelers are loaded correctly, users are able to view the details in the learning plan form. Select a node where a task guide is attached and hit Play task guide button. User is taken to a new window with the steps from selected task guides displayed. User then can start the task guide or back out, based on his selection. If the user selects to start the task guide, task guide is loaded in the run mode and guides user to each step. Perform the steps as mentioned the guide and exit once all the steps are completed. User who is loading the business process modular’s from Microsoft Dynamics Lifecycle Services has adequate access on the LCS to perform this action. Any edits required to be made to the task guides must be done from the Microsoft Dynamics Lifecycle Services. Structure for the loaded Business Process Modeler’s will be as per the structure defined in the Microsoft Dynamics Lifecycle Services. The learning plan parameter and learning plans are company specific. If the user wants to set up learning plans in multiple companies then he needs to configure in each company.